The New Publisher Area Is Live! Well, I feel it is time to steal Buzz Lightyear’s catch phrase: “To infinity and beyond!” PeerFly has been steadily growing and expanding since we have started in the CPA space in early 2009. Before PeerFly’s launch, Chad (PeerFly’s fearless leader and code junkie) did not sleep, nor socialize, he only spent time building PeerFly’s custom platform. Again, much to the dismay of his wife and friends, Chad locked himself away and has put together the new look and feel of PeerFly’s publisher area that you can see and experience now. Now, just as in 2009, everything was coded in house to ensure that there were no mistakes made. 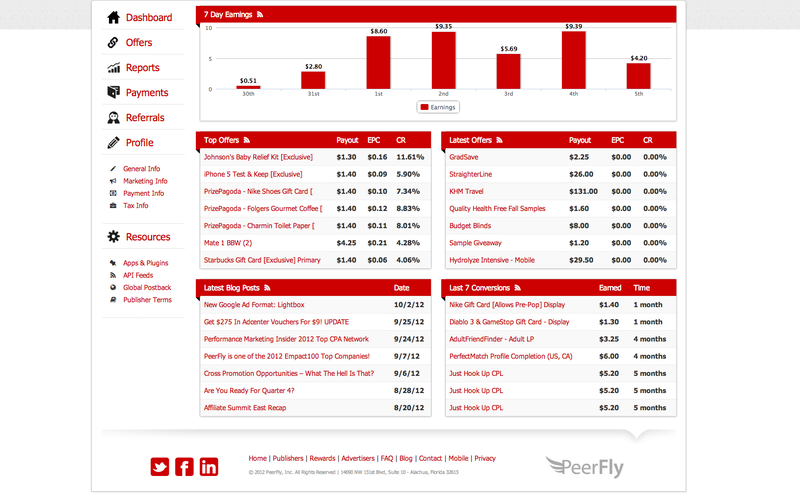 Since PeerFly’s launch in 2009, there have been over 100,000 publisher applications come through. The number of active publishers has grown exponentially as well. We have over 40,000 active publisher accounts as of this writing. With this type of growth in the number of publisher accounts, the need for a new and more robust platform for our publishers to keep track of offers, stats, and any other tracking needs they may have was definitely apparent. 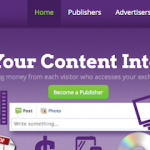 With the new publisher area for PeerFly publishers, not just the looks have been updated. The system is now much more robust in the searches that can be executed, and in the way PeerFly publisher reports can be run and generated. More and more features are going to continue to be added to make this the best of all CPA platforms available! Please log in to your account and have a look around. Feel free to let us know if there is anything that you are looking for. If you have any issues with the functionality of the site, let us know! I look forward to reading your comments below! Good news. Thanks for your sharing Davey. I am glad that I am admitted to PF. I am expecting guidance from AM Davey to get started promoting CPA offers in PF. At first glance it looks nice but i think it’s going to take a while to get used to! I really like what you’ve done with the Admin area. Big improvement! The New Publisher Area Is GREAT. Where do you get a long link for offers now? The “Build Link” link is the same format as the long link. The tool tips for marketing methods? What was better about the old one? The drop down list of 26 categories, on the Offers page, is too big for my widescreen laptop, so I can’t see the bottom of the list. Other than that, looks good! What resolution is your laptop? We no longer have the option to choose an offer domain? Correct. You’re free to purchase a domain and use that to redirect. Do the old domains still redirect to offers properly or should we now replace zillion links we posted so far? They do for now, but I’d switch them over. It’s a good idea to use your domain and redirect to PeerFly. You should not be posting PeerFly links or any of our tracking domains all over the place. I like it but I get a bit messed up display. I’m using Chrome. Could it be that my name is too long? Just would like to say Good Job, really liked the new layout..
great guys!! it looks very nice… but I think there is a bug.. I have 9 referrals and I dont have them listed in my refferal page which is strange..
You can see your referral count at the top. To see what you’ve earned from them choose a date and click “Run Report”. I am using Chrome as well, the ‘dashboard-welcome’ div overlaps the content portion every time you search for offers or refresh the page. It stays there for a second, then snaps into place where it is supposed to. Other than this, the admin section looks good, but will take a little time to get used to. Just found out why – the loading wheel. If your screen is not big enough, it will cause the dashboard welcome div to wrap down into the conten when the loading wheel is showing. I tried this on IE and it did the same thing, so it’s not a browser issue, rather a screen size issue. My screen resolution is 2560×1600, but I have my individual windows smaller. If the window is set at 1280 wide, then it will look fine, anything less and that div will wrap into the content of the page. Looks GREAT!!! Make it alot easier to navigate. Great work guys! This one is better than previous. I also miss the Earnings tab, where you could see when each conversion was coming in, other than that it looks and works awesome! What does it show? Upload a screen shot here: http://imgur.com/. You guys remove the option to choose a domain for the offer? tsk! not good! i want work with u could you please help me out ? Really nice look of new page. which shows all data in one page. I work through Google Chrome and your site displays badly in it. So it’s impossible to work normally in account. The previous look was better. It looks and works perfectly in fine in Chrome for everyone here. Please post a screen shot of what it looks like for you. Offers should load pretty fast. What browser are you using? I’m using chrome. Not having any more delays now, it was my internet connection that was the problem, got it fixed and all is working smoothly. I want to join Peerfly as a Publisher but If i don’t have website. Can I apply as Publisher or not?What is the requirement for joining your Network. Your reply please. If you plan on using a website to promote our offers then you’ll of course need a website. That would be considered spam. You don’t need a website to promote our offers with paid traffic. in the old version i could search in the offers section by type. is that gone now? I hope not.for example i could hit a drop down menu and select all email submit offers.. i only seem to be able to search by keyword now. also when i search by keyword, i find an offer by keyword and i select one i like. then i look at the landing page . when i hit the back button, it doesnt go back to the search i had, but to the generic offers page i started at before i searched -so i lose my place and have to re-search to get back to it. I just tested this and it works like it should. When I press “Back” it goes to the my original search. Actually I have the same issue, it does not go back to the Search. I start off by click on “Offers”, I click on the first one in the list “100 vouchers”, I hit the back button, and I’m back at the publisher homepage/dashboard This is my URL in the browser once I hit the back button (https://peerfly.com/pubs/index.php#). I tested this and it worked as expected. What browser are on you on? I am on Google Chrome. And by the “back” button I am referring to the browsers back button, not the link on the top right that says “Back”. That’s expected since the offers page isn’t a separate page. The bottom panel with Peerfly social buttons keep getting in the way. I don’t need to keep seeing that panel. I want to be able to see the different size banners side by side instead of having them appear only on mouseover. How’s it getting in the way? Previously, you could click on the offer in REPORTS to see the offer but now you have to manually search via the offer ID no. Can you bring back this function please. And I prefer the old layout. Granted it’s not as snazzy. But it works way better and definitely more functional. Guess style always wins over substance these days. Thumbs down for the new layout. Thank you for the feedback. We understand that change is hard, however the old layout was no where near as functional or easy to use as our new one. The old one was too simple for our needs and it was time for an upgrade so that we could expand our feature set. 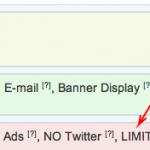 I’m really concerned about old links not working because of the tracking domain…. The old links work for now. You should have been (and still should be) masking our links with your own domain so that you can easily switch offers if needed. If an offer is paused, for example. For contextual links I don’t mask with my own domains. 1. Firefox doesn’t offer me to save password. 2. When I go in offers the check some offer I press “back” it returns me all the way to the dashboard, then I have to go all over again. I’ll have to open new tab everytime I want to check offer. The new layout is very clean and easy to navigate through. The 7 day graph is much easier to read as well. The only thing constant is change. Your interface is the best I’ve seen – nice, clean and functional. Excellent job! Isn’t it possible to search through offers with a keyword? Say I wanna find all offers with the word “music” ? Yes that’s possible. Type in “Music” into the “Search Offers…” input bar. Can you guys add filters to allow us to find offers that allow particular types of traffic (like PPV etc). Do you havea forum ? Can you name a few good cpa forums ? 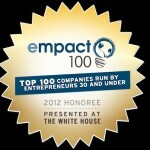 PeerFly is one of the 2012 Empact100 Top Companies!